The following were the TNSAR trainings for the 2006 - 2007 season. Join Bernie for a great day hike up around Mt.Rose. Don't forget your water. Dirk will run us through the truck's equipment and how it all works. Dress warm. Even though we rarely venture there for searches, it's still a great moderate hike. Jim will lead us from Barker Pass down the Powderhorn trail and up and over the five lakes trail. A beautiful Autumn hike. Call Jim for shuttle details. A plethora of fantastic views will abound us on our hike from Donner to Squaw Valley. A stout hike for everyone involved. Check out the pictures. This will be a two day training Nov 4th & 5th in wilderness first aid and will be taught by Sue Purvis from Crested Butte Outdoors. Check out the pictures. A plane has crashed on Donner Summit and we are called out. Tensions are high. What are we going to do? Join Dave as we search for a old wreck up on the Summit. Bernie (master of technology) Mellor will show us how to use modern GPSs in a great location. Dress warm! May the gods(or godesses) bless us with snow by then, but Jeff will lead us on a great terrain familiarization regardless. The Com Van will be used in a small mock search utilizing all the radios and equipment. Skiers are urged to attend. Join Karen on a great tour up into the basin of many surrounding peaks. The Resort is hosting the Winter Injury Sports Medicine Symposium. The Symposium is free for TNSAR members with an OES card, and will include dinner and a raffle drawing. Doug has a reservation for Friday night at the Bradley Hutte; the real training shall commence in the morning. If you can't make it Friday meet at the Pole Creek trailhead Saturday (12/9) at 8am. Bring a lunch and be prepared for some surprises. Steve will present a short course on rescue scenarios. Be prompt! Steve will explore the Castle Peak environs and beyond. Steve will present an evening refresher course for map and compass skills. Always a pleasure to access this area via Squaw lifts. Pictures from Mark and Brian York! We always can use practice with these much needed and used pieces of equipment. We haven't had access to a training like this in a long time. Come learn the basics in a classroom type setting. This will be followed up with practical training exercises. This is an introduction to how the Comm. van operates. This piece of equipment is an invaluable resource for the team. This is an excellent way to get involved with the team without being a skier. Skiers are encouraged to attend. The practical side of high angle rescue. Come prepared for a cold long day. We will put our new knowledge to work in a vertical setting. Pictures! The do's and Don'ts of water type rescues and more. We will cover how to stay safe when helping others in a crisis. Let's explore the in's and out's of Alpine Meadows. 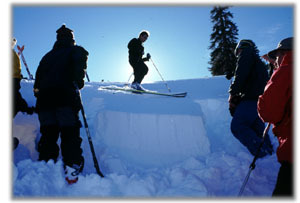 This is popular search terrain and the chance to do some skiing. You have to call in advance to join in on this one. This is a follow up for Comm. Van 101. Learn how it is used during an actual search. A mock search will be coordinated by everyone who attends. Since we haven't had any searches lately, some practice is good for us. This training has been CANCELLED. Sorry for the short notice. When: 7:30am Team Garage; 8:00am Wild Cherries Coffee in Truckee. Come ski up into the ever popular Donner Summit area with an avalanche scenario to practice those all important avalanche rescue skills. Pictures! This ties together and explains all the electronic gizmos we use during a search. Bring your laptop computers. Another all day adventure on the Westshore of Lake Tahoe exploring the mountains. This training was pushed back one day from the original posting. All snow capable machines and skiers are encouraged to attend. This will involve the coordination of the various teams in a search type atmosphere. The Comm. van is an important link for a successful search. Come learn the basics of how the radios and computer in the van work. This is the fastest way to participate in an actual search. This training will NOT be held unless people call and sign-up. This will probably be cancelled. Call ahead. From Sugarbowl, we will make our way toward Anderson Peak, the home of the Benson Hut. We will expore the safe way to this popular hut along the ridge from Sugarbowl. All Snowmobile Team Members are encouraged to attend. We will ride between Tahoe City and Riffle Peak. Plan on a full day. Must contact TJ or Brian to attend. CANCELLED due to lack of snow! All Snowmobile Team Members encouraged to attend. Location of ride will be determined by snowpack. Check back for updates.